These RO faucets are available in a polished nickel finish, which blends the warm tone of nickel with the luster of a polished finish. 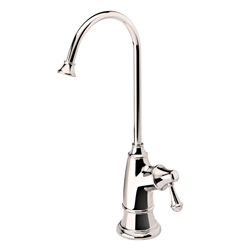 The faucets feature a lead-free brass body, a smooth-operating lever-style handle, a patented removable modular air gap, a protective spout tip and a high-reach neck of approximately 12 in. that swivels 360 degrees. They are certified to NSF/ANSI standards 61-9 and 372.